SMD LEDs: Surface Mount Device or “Chips” utilizing leaded or lead-less package styles was another innovation in LED package styles. This type of package did not require PTHs. Plastic Leaded Chip Carriers are popular with sizes based on surface mount electronic formats such as chip capacitors. 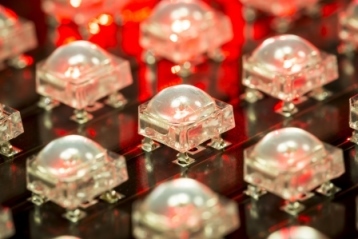 This format was also incorporated into devices with more than 1 LED die, including 3-die RGB formats with 4 I/O. With the advent of chip-scale packaging, which is a leadless SMD format particularly utilized for Power LEDs, back-side solder pads are used for I/O, as well as a “thermal pad” that transfers the heat to the PCB, with the PCB typically having a number of PTH used for thermal purposes of transferring the generated heat to the backside of the PCB. This style LED typically utilizes a SMD format. It is based on 500 x 500 micron or similar sized die, usually 1 die/package. 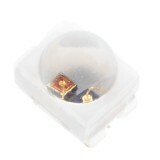 This style LED typically utilizes a SMD format. It is based on 1000 x 1000 micron or similar sized die, usually 1 die/package.